Australia is a great place to live and work. Australia offers a great standard of living and is so vast there is a climate to suit everyone. As with everywhere however, some bits are less great. Here are the things I love about Australia and the things I don’t. Australia is a country of immigrants. Aside from the native aboriginals everyone else has come here from somewhere else and this makes Australians a diverse bunch. Australian society, as a result, is multicultural and lives by the principle of giving everyone a fair go. If you say you are capable of something you will usually be given the opportunity to prove yourself. We have all done it, pulled our clothes out of the washing machine and found a chewed-up and virtually destroyed bank note. In Australia however the money is waterproof, meaning you can take it for a swim at the beach or send it for a spin in the washing machine and still spend it later. How cool is that? Australia is one of the few countries that, from an immigration perspective, recognises de facto relationships. It is possible to live and work in Australia if you have an Australian partner, even if you are not married. This is not the case in the UK where you have to be married to allow a partner who is not a European citizen to remain in the country. Australia has a TV channel dedicated to foreign news coverage and occasional foreign language films. This channel presents a perspective other than Australian on world events (as long as you understand it). It must be a great comfort to non-English speaking visitors and migrants too. Australia is enormous. It is so big that flying across it takes over four hours. While this means that getting about can take a while, it also means that whatever sort of climate you prefer is available somewhere, you just have to discover it. Where else in the world are you going to find such a weird and wonderful array of wildlife? Kangaroos and koalas are popular. Snakes, spiders and sharks have a less friendly reputation. My favourites personally, are wombats because they use their backsides to crush predators, which I think is hilarious. Australia is obsessively protective of its native wildlife and flora and fauna and has imposed strict quarantine rules, even between Australian states. Australia has great beaches but sadly the water is also home to creatures such as sharks, crocodiles, blue-ringed octopus and irikanji jellyfish, all of which can kill you. Combined with some serious rip currents, these significant dangers mean exercising extreme caution at the beach, which is not hugely relaxing. Australia is the land of rules and everything seems to involve some form of control varying from the legal requirement that cyclists wear helmets to the number of pets you are allowed to keep, compulsory voting and a ban on consuming alcohol outside permitted areas. Personally I don’t understand why cyclists would choose not to wear a helmet, and make themselves more vulnerable than they already are in the company of other road users, but I think criminalising it is going a bit far. Equally, if you are not drunk and misbehaving why should having a drink while minding your own business attract a fine? I see these as heavy-handed limitations on personal freedoms that I took for granted in Europe. 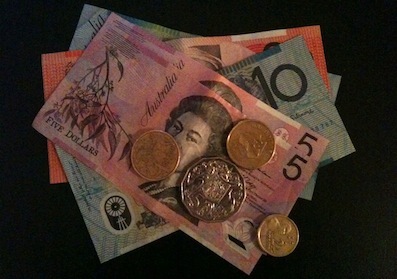 Australia’s economy remains strong despite the global economic crisis. How has it affected us? We earn roughly the same as we earned in Europe but rent, groceries, utilities and other expenses cost significantly more. Our groceries cost four times what they cost in the UK for example. Domestic travel is also prohibitively expensive, especially in regional Australia, which is one of the reasons so many Aussies holiday in Asia. I have experienced some surprisingly bad customer service in Australia, which I think is attributable to the fact that the minimum wage is fairly high and tipping is not customary in Australia. This means people in customer service roles are not working for tips in the way they do elsewhere. They can do a seriously unimpressive job and still take home a decent wage. Perhaps it is just the ‘laid-back Aussie’ culture. It comes as no surprise to people who have done a bit of research before moving to Australia but the timezone is significant. It is really awkward and only offers a very narrow window in which to communicate with Europe or America. If you miss the person you are trying to reach one day, in most cases, you will have to wait another full day before trying again. If you don't need to contact anyone outside Australia it won't be too much of a problem, but if you do it is annoying! I’m British and living in Australia, and while I’m aware that I have just detailed some of the things I don’t like about my adopted home, I like more than I don’t like or I would have left. Brits in Australia have a reputation as whingers. I don’t mean to whinge in this post, but rather I seek to honestly highlight some of the good and some of the bad about living in Australia. Which things do you love and not love about Australia?